Max Townshend is one of the most eminent hifi designers and manufacturers in the UK, and he has more than 50 years of experience, meaning he was already active in the business before I was even born! Hifi has changed enormously in those years and Townshend seems to have adapted well to the demands of the modern age. Having said that, one of those demands is for high quality turntables and Townshend's famous Rock turntables have been going strong for years and years, just like the air suspension products. On the other hand, Townshend is also smart enough to detect something new and interesting when it appears, and one of these things has been the use of transformer volume controls. I actually thought that this was a recent innovation, but Max told me that the idea has been around since the sixties! I love transformer preamps. I've had my Django for years now, and it has never disappointed me. I love the principle of transformer preamps, as it promises, and delivers, all the advantages of both active preamps as well as classic passive designs. This all comes from the fact that a preamp actually doesn't normally do any amplification, but almost always attenuates the signal. That means that you can leave out the gain stage in a preamp and just use a volume control. This approach can work very well, but has the disadvantage that it will worsen the impedance match between the source and the power amp. Using a transformer, instead of resistors as in a normal attenuator, will actually improve the impedance match, as long as the preamp attenuates the signal. In all the years I've had the Django I have never, ever had to use the top third of the volume control, so I can safely say that a preamp will virtually always be attenuating the signal. This makes a transformer volume control an excellent device for use as a preamp. Another interesting advantage with (auto)transformer preamps is that you don't need to worry about mains quality or mains leads. Given that there seem to be people out there that spend more money on mains cables or conditioners than the cost of the Allegri, you'll be laughing. The technology is also more or less bomb proof and very unlikely to ever fail or wear out. The main difference between my Django and the Allegri is that the Django uses S&B TX102 transformers, while the Allegri uses Townshend autotransformers. The difference between a transformer and an autotransformer, or autoformer, is that a transformer has two separate windings: one for the input and another one for the output. The output winding will have several taps with which the desired volume can be selected. An autoformer only had a single winding: the input uses all of it, while for the output a smaller section is selected. This means that there will still be an electric connection between input and output, while a transformer enables full separation of input and output. One advantage of this is that transformers can break ground loops, and another is the ability to accept balanced inputs and outputs, although the output will never be properly balanced. On the other hand, autoformers are said to have stronger bass, because of the more direct connection between input and output. 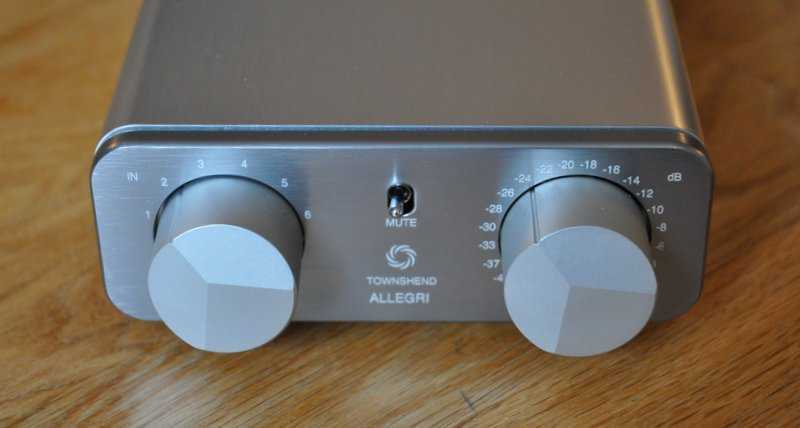 The Townshend Allegri preamp is a budget version of the famous Townshend Glastonbury preamp. The Allegri works on the same principle and actually uses the same parts, but is simplified to the most basic functions and put in the smallest and most cost effective enclosure to keep the price as low as possible. Still, the sound quality should be the same as the Glastonbury. 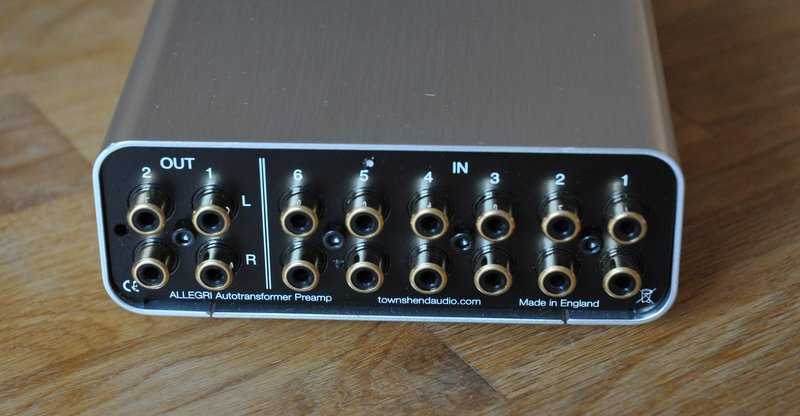 The Allegri has 6 inputs and 2 outputs, all single ended RCA. There's no remote control and the volume can be set in 24 discrete steps, ranging from -60 to +4 dB, but for optimal performance the top of that range should be avoided. The Allegri is purely passive so doesn't have a power connection. The only luxury the Allegri offers is a mute switch. The Allegri works very well, but the feel of the selector and volume control is not nearly as nice as with the Django, or most other amps in this price range for that matter. There's some play in both knobs and a lack of solid, positive stops, making it feel a bit loose and soft, to be honest. No problem, of course, but ever so slightly disappointing for a £2000 product. On the other hand, the whole idea of the unit is to offer audiophile top quality for the lowest possible price, so we shouldn't complain, really. Another minor niggle is that the case is very small and a bit light, resulting in a tendency to slide when used with heavy cables. Again, this has been done on purpose, to keep postage cost low when sending the Allegri to customers worldwide. The main comparison here will be with my Django, obviously, but I was also able to use it with the new Oppo BDP-105 Blu-ray player, which has a built-in digital volume control. Both very interesting comparisons, I think, as the Django uses related technology and the Oppo will allow me, in theory, to bypass the preamp altogether. My Astin Trew AT3500+ CD player was also available for CD replay. I used my Unity Audio 'The Rock hifi' active speakers to listen to all these sources, as well as my Usher R1.5 power amp and my Dynaudio Contour 1.8 mkII passive speakers. Most of the listening was done on the Rock active speakers, as they are most revealing. The Django is already an excellent preamp, so that doesn't leave much room for real improvement, at least that was my expectation. And indeed, the differences between these two preamps are not enormous. They basically both sound absolutely fine and are both capable of excellent technical and musical performances. The advantage of (auto)transformer technology is that there's no noise from a power supply or the mains, so the result should be nice and quiet with minimal interference. Both preamps live up to that, and produce very musical and enjoyable results without even a hint of noise or electronic hash. They also show excellent drive and control, something that I've come to expect from a transformer based preamp. Still, there are also small differences. The Allegri is stronger in the bass, producing a slightly fuller sound with more weight and impact in the lower frequencies. There also seems to be a bit more headroom, with peaks handled in a cleaner way than the Django, which can sound ever so slightly compressed in comparison. The Allegri is able to let the music breath and flow to an even greater extend than the Django. It is actually very difficult to hear any effect of the Allegri, except for the attenuation. It seems to have complete extension for the lower as well as the upper frequencies, not restricting the music in any way. Things can change when using balanced connections, which is not possible with the Allegri. The Oppo has balanced outputs, which are marginally better than the phono outputs, and my Rock speakers prefer to be driven through their balanced inputs. Balanced connections also have a theoretical advantage for noise cancellation on top of this. Used like that, the Django manages to come alongside the Allegri, showing that there can be an inherent advantage to using full transformers. But, compared fairly, so both used with unbalanced connections, the Allegri is the better preamp, there's no denying that. What always impresses when listening to the Allegri is the natural and unforced sound it produces. The same is true for the Django, but to a slightly lesser extend. The Allegri seems to be able to get out of the way of the music, leaving virtually no footprint on the signal at all. This becomes very clear when comparing it to the Oppo used in variable volume mode. 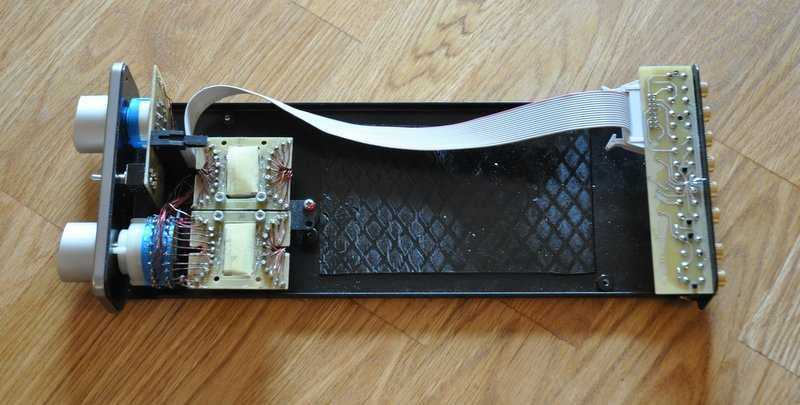 This allows the complete removal of the preamp, and improves things even further, but only by a small margin when used with the single ended connections. You really need to listen to both very carefully, otherwise you'd miss the difference. I do have to add that the digital volume control of the Oppo works particularly well in my setup because my Rock active speakers have a sensitivity control that enables the Oppo to play in its optimal region, which is with minimal attenuation. Used with 'normal' power amps the difference would be smaller, or could even change enough to give the Allegri the advantage. This first comparison was with phono leads, but connecting the Oppo directly to the Rock active speakers also works best when using the XLR balanced connections. When used like this, the Oppo's digital volume control more easily beats the Allegri, which is forced to use the single ended connections. The difference is still not earth shattering, but noticeable nevertheless. So, you really have to try to beat the Allegri, and on a level playing field I simply can't. In a way it isn't even completely fair to the Allegri to just compare it to my Django and the Oppo BDP-105 in preamp mode, especially used with balanced connections. These are two of the best preamp solutions that I know and telling you that it is a bit better than a Django and almost as good as an optimally used digital volume control is actually not doing the Allegri justice. The fact of the matter is that this is an exceptionally transparent preamp that sounds absolutely brilliant with everything you care to throw at it and effortlessly drives everything you care to connect to its outputs. It simply never fails to sound great, really opening up recordings and giving you a completely clear and honest picture of everything you play through it. And it doesn't stop at transparency, as the Allegri also has great drive, bandwidth and resolution. This really is as close to a universal straight wire with attenuation as you can get, at least without spending silly money. I was lucky enough to be invited by Max Townshend to have a listen to his reference system. I took the opportunity to also bring the Django along, so we could compare it to the Allegri in a proper high-end system. First of all I have to say that Max's system was a real revelation: even when playing standard CD's the sound was stunning, and when playing high resolution formats it all sounded exceptional. It is rare to hear a system that is properly full-range, with life sized dynamics and which then still manages to sound as delicate and natural as Max's setup. I was thoroughly impressed. Obviously, the difference between the Allegri and the Django was more clear in a system like that. The Django certainly didn't disgrace itself, but sounded a little bit veiled and slightly duller compared to the Allegri and its bigger brother the Glastonbury preamp. Both Townshend's amps sounded very similar and produced a more focussed and refined picture than my Django. Was the Django the winner on value in my own system, in Max's super system the price for best value very obviously went to the Allegri. Even the fantastic Glastonbury preamp couldn't really better it. 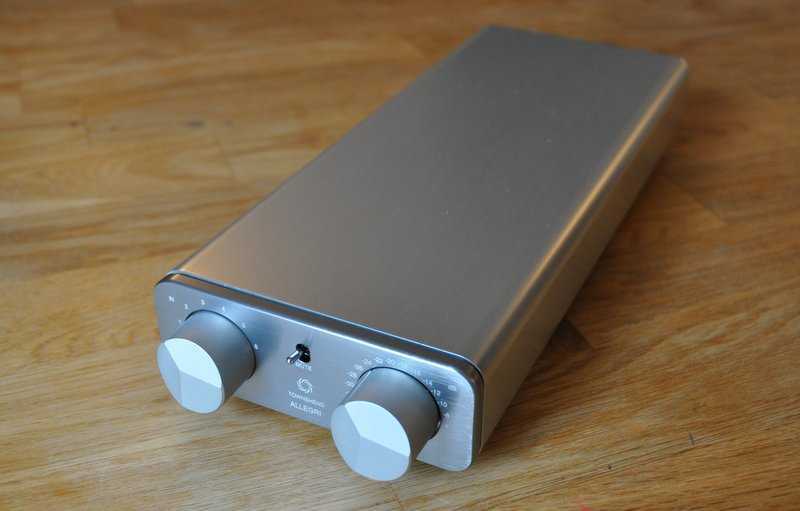 A fine preamp, there's no arguing with that. Sonically it is absolutely top notch, even beating my lovely Django, although not by much. The sound is refined and natural, with very strong bass and incredible transparency. It is small, feels a bit basic and is extremely limited feature-wise, but that is the whole idea of this product: to give you the high-end sound for a more affordable price. And it succeeds. It is difficult to call a £2000 preamp good value, but with sonics like this there's no denying that you're getting a lot for your money. Highly recommended.